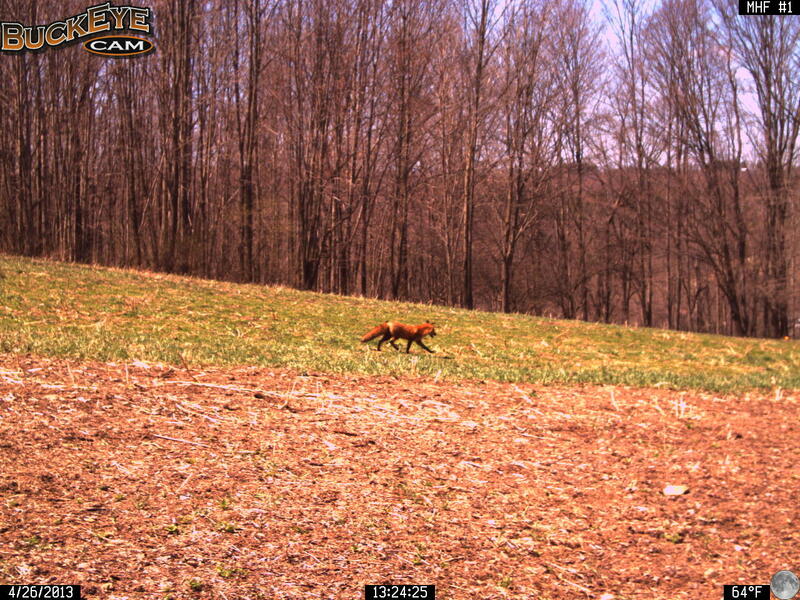 This Red Fox is on the move during the day as Spring weather warms and the clover is starting to regrow in 2013. In the direction it is headed it is on target to move towards the neighbors chicken coop. Last year we had a den with a mother fox (called a vixen) and some kits about 100 yards from this spot. There were a lot of chicken feathers around the outside of the den on the ground. 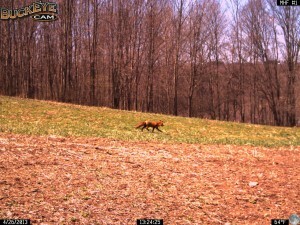 The fox was also observed hunting mice in the field. It takes a lot of trips to feed hungry growing kits. 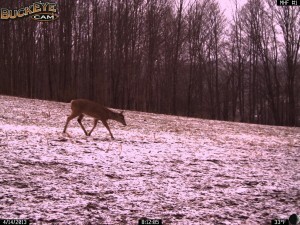 The Imperial Whitetail Clover is beginning to green up in western NY State. 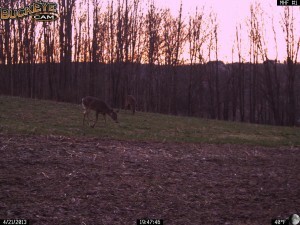 The deer are beginning to browse the clover and add some quality protein to their diet. So far we have photographed as many as four deer at one time in this plot. The Fall 2012 brassica, turnip and radish plot in the foreground has completely disintegrated over the winter. This is a late spring even for western NY in 2013. Chicory survives late spring flooding in north Georgia. This fall planted Chicory survived a late spring flooding in north Georgia. Tecomate, Max-Attract Mixture and Rackmaster, Deer Greens Mixture were planted and were well established going into winter. This Max-Attract seed included triticale, oats, peas, yellow clover, crimson clover and Commander Chicory. Additionally Rackmaster, The Deer Greens seed included rapeseed, turnip, daikon radish, and kale. 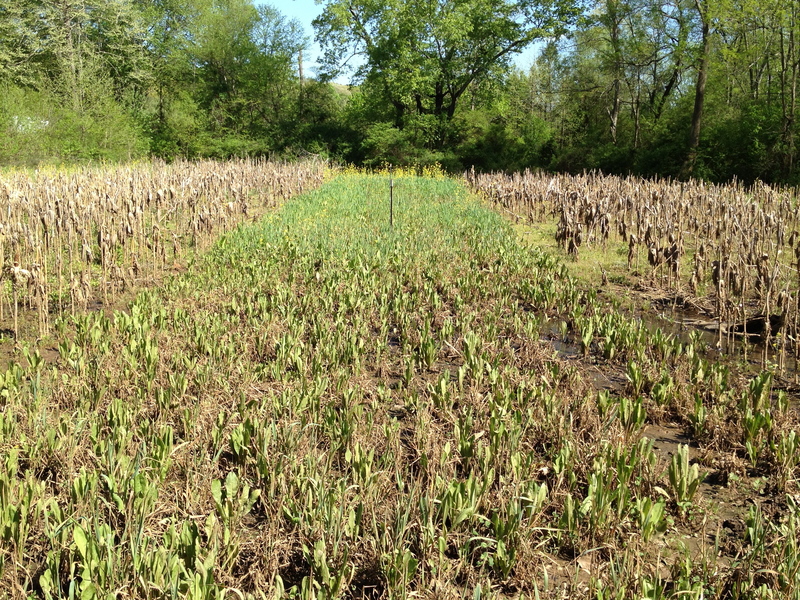 In the wettest areas after the flooding, the Commander Chicory was the only thing to survive and vigorously re-grow. Having observed this chicory last summer the deer readily consumed this high protein forage. 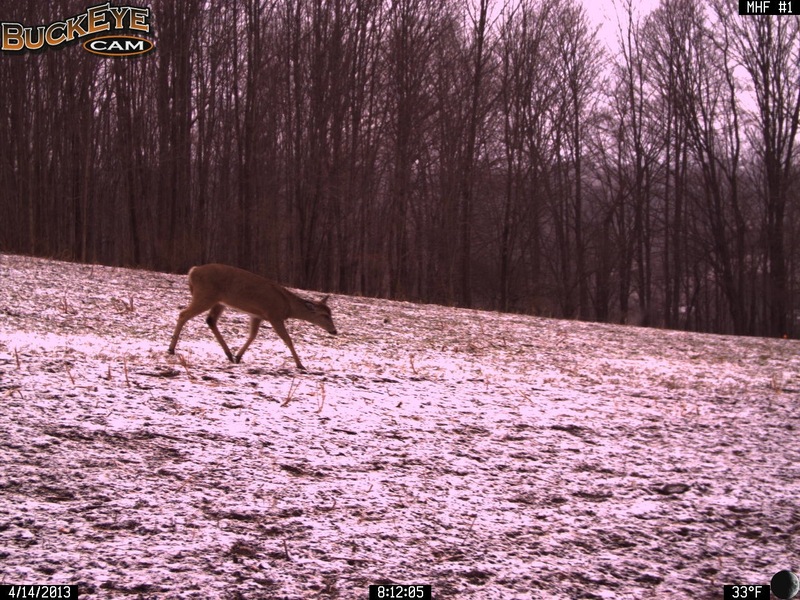 The snow has finally melted and the deer are now separating from the winter herd. After a long snowy winter where the deer herded into groups of 10 to 100, the herds have broken up and the deer are returning to their old haunts. 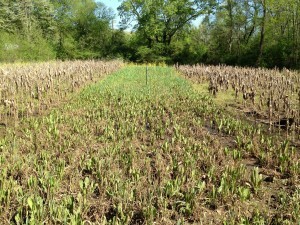 In this case the deer is visiting last years food plots from 2012.